Two players from prominent Scottish golfing families figured in a four-way tie for the lead after the opening round of the PGA EuroPro Tour’s Qualifying School first stage at Haggs Castle. Both out early at the Glasgow venue, Zack Saltman (Archerfield Links) and John Henry (Clydebank & District) carded matching 69s before seeing two other players, including Edinburgh-born Reeve Whiston, also sign for three-under-par opening efforts. Saltman, the younger brother of Elliot and Lloyd, picked up four birdies in the first six holes then had four bogeys in the middle of his round before posting three more birdies in the last six holes. Henry, whose older brother, Scott, is on the Challenge Tour, had four birdies on his card, including the first and last - both par-5s. Whitson’s father, Kevan, was the professional at Turnhouse before moving to Royal County Down. A product of the Irish system, the youngster made his promising start with a round that contained six birdies. 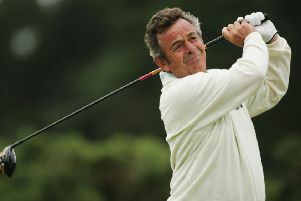 Later in the day, Englishman Colin Maroney made it a four-way tie for the lead in the 36-hole shoot-out after starting with an eagle then adding three birdies. On a packed leaderboard, no less than nine players are sitting a shot off the pace, including home hopefuls Kevin McAlpine, James Hendrick, Michael Paterson, Fraser Moore, Scott Stewart-Cation, Ryan Campbell and James Steven. Duncan Stewart’s closing 69 saw him finish joint-third behind English winner Andrew Marshall in the MENA Tour’s El Jadida Championship by HLO in Morocco. Stewart, who hails from Grantown-on-Spey but now lives in Edinburgh, set the clubhouse target after his six-birdie salvo for a level-par 216 aggregate. As player after player failed to beat that, he ended up with only Marshall and Austrian Florian Praegant finishing above him. Two behind at the start of the day, Marshall’s closing 72 for a five-under total saw him enjoy a four-shot turnaround on Praegant following his 76 that included five dropped shots in the last six holes. Dunbar’s Neil Fenwick backed up Stewart, who is attached to Turnhouse, by finishing joint-fifth in his first start of the season. Jack Nicklaus will replace Arnold Palmer on the World Golf Hall of Fame Commission Panel, joining Nancy Lopez, Gary Player and Annika Sorenstam. “Being elected into the World Golf Hall of Fame, especially with the inaugural class (of 13) in 1974, was one of the unquestioned highlights of my career,” said Nicklaus. “It was a sign of respect and validation for the hard work I put into a game I have always loved and considered the greatest game of all. Also announced today was a change to the qualifying age. Effective immediately, candidates must be at least 50 years of age at the start of the year in which selections are made, replacing the previous age requirement of 40. The exception would be if a player was at least five years removed from being an active participant on his or her respective Tour. Scotland made a winning start in the Under-16 Boys’ Quadrangular International at Hilton Templepatrick in Northern Ireland. After sharing the foursomes 2-2, the Scots won the afternoon singles 5-3 for a 7-5 win over Wales. Hosts Ireland lost 6.5-5.5 to Netherlands in the other match. Stirling and St Andrews are on course for a title showdown in the Scottish Students’ Championship at Moray. It follows both teams recording comfortable quarter-finals at the Lossiemouth venue, where Stirling now take on Highlands and Islands while St Andrews are up against Strathclyde. The women’s event, which is being played on an individual basis, sees two Stirling team-mates - Gemma Batty and Chloe Goadby - meet in the final. Kinross kid Calum Hill has chalked up a first win on the US college circuit. The Western New Mexico University student won the St Edwards’s Invitational at Onion Creek in Austin, Texas, with 10-under-par 200 total.